“I feel happier, lighter, less stressed and more in control,” my clients exclaim after we organize a space. They have a sense of accomplishing something important. I literally see relief in their faces as we make progress. Spring starts on March 20. Spring cleaning may come to mind. But I’m not thinking about dusting tops of ceiling fans. As a professional organizer, I’m thinking about cleaning out and organizing spaces. Let’s organize your bedroom closet. Before we start: specify your goal, be rested and well fed, wear comfy clothes, label four bins Donate, Recycle, Elsewhere and Repair, and have large Hefty bags for trash. Some organizing experts advise emptying the closet and dumping everything on the bed. I am NOT a fan of this approach. What happens if you don’t finish that day? You’re left with a huge mess! My approach works if it takes one day or one week. Begin with hanging clothes. Start at the beginning of a rod. Without skipping around, leave hanging what you want to keep. Remove what doesn’t fit, you no longer like, or is outdated, torn or stained. Place those items in the corresponding bin. Things that do not belong in the closet go in the Elsewhere bin to distribute later. Group remaining hanging clothes by category (tops, slacks, suits and so on). Repeat for the shelves, drawers and floor. If short on space, use over-the-door organizers for shoes, sweaters or other items. Put donations right in your car and drop them off. Act on things in the other bins. It doesn’t all have to be done at once. Having a hard time letting things go? Someone gave you something you don’t like? Donate it and make someone else happy. Things were expensive? Forget what you paid – that money is long gone and you’re wasting space. Some things sentimental? Put adorable baby outfits in an archival box and store elsewhere. Have commemorative t-shirts made into quilts. Check out OnceUponATimeCreation.com. Remember your goal. You now have homes for everything in your newly organized closet. 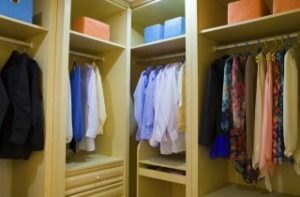 Clothes will be super-easy to find and put away so maintenance is simple and quick. Fun fact: We wear 20% of our clothes 80% of the time. Curious to know which hanging clothes you actually wear? Turn hangers backward so hooks point toward you. When you wear something, turn the hanger the normal way. Do this for one year and see how many hangers face the normal way. You may be surprised! Donate what you no longer wear. I guarantee you’ll feel happy after you organize the closet. Being organized makes life so much easier. Find out for yourself! Is Being Visual a Trick or Treat? previous post: What’s Your Favorite Indoor Activity? next post: Is Your Kitchen Making You Fat?